She did get over her fear enough to watch some worms, and even spontaneously pick one up to show me. And she did eventually plant some seeds. We got carrots, two kinds of beets (Ruby Queen and Chioggia), and some rutabaga I got in a recent trade into the ground. I stopped to curse at some bamboo and raspberry shoots and pull them out of the ground, through the main bed into the side one, where both run rampant, and right through…garlic. I’d planted bulbils (see my header) a couple of years ago, knowing it would take a while to get real garlic out of them. Last year I’d briefly thought about them, but the right time to pull them was just about when I was getting back to work after Maia’s birth and there was no time or inclination there. In the fall I’d even considered planting some, but the beds weren’t ready. But now, it seems I have garlic! It needs transplanting, since there are clusters together–it looks like I could have gotten some good heads last year–and also I plan to do battle with the bamboo and raspberry this year. But I can do that. I’m happy to do that. And then I will have garlic after all. A sudden rainstorm–and the call to dinner–cut short my session, to my disappointment and Chloë’s relief (except that she was upset I wouldn’t let her go look at the peas “in the garden with no bugs”). But next time: transplanting. The weather was unseasonably beautiful today, and Chloë and I went out to the garden. She was mesmerized by the worms I dug up while clearing out the path (to be filled with wood chips in a week and a half, I hope), and wanted her own shovel to help me dig. She tried to help me dig up and smooth down the new bed, and was delighted to plant peas in the holes I made with my gloved finger. “Can you hold these for me?” she said excitedly, shoving the extra seed packets I’d handed her so she could properly hold the peas and drop them, one at a time, into the designated holes. We planted Alaska peas and Golden Sweets and some Christmas lima beans, and then a row of carrots. “See, these seeds are little,” I explained, over her “Can I do that?” which I heard no more than, oh, seventeen times while we were out. “You pinch some and sprinkle them in this row, like this.” I let her try. She didn’t do too badly. She was thrilled when I let her use the spade to cover them up afterward, and sorry when I said it was time to go inside. 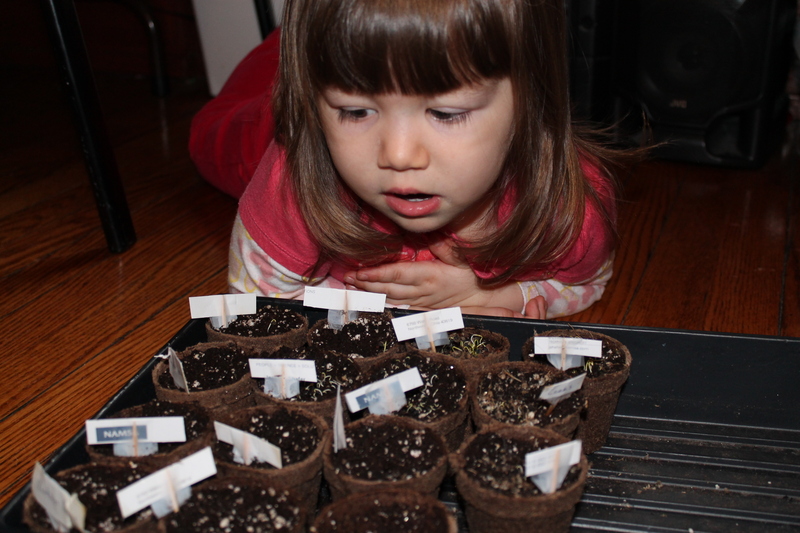 But we’ve got wonders inside, too: the onions and leeks and cotton that she helped plant. (Plus a tester pea and bean plant to see if I’ve got rabbits and if they’re going to bother that bed; if they are, then I’ll go get netting in the next couple of days.) “Way-ow,” she breathed, seeing the shoots popping out of the little Jiffy pots. And then, “Can I have one?” So I let her eat a shoot. We should have planted more. Four-year-old cotton seeds will grow just fine, in case you wanted to know. My Erlene Greens and Nankeen Browns are unfolding their cotyledons now, all wrinkled and lime green. Chloë looked at the seed tray today and said, “They look like butterflies!” And they do, you know. Currently started: the cotton, Lolla Rossa lettuce, candy onions, scallions, Sherwood leeks, and garden huckleberry in the seed tray. Everything but the huckleberry is up. (Since garden huckleberry is apparently a solanaceae, it was probably too early to start them anyway…and it hasn’t been a terribly long time since we planted, either.) Out on the steps: Siberian Kale, Red Russian kale, Bright Lights chard, komatsuna, choy sum, obedient plant, brown-eyed Susan, safflowers, and a mix of other flowers that Chloe liked the looks of–I know there are some Johnny Jump-Ups and marigolds, and some cosmos, I think, and maybe some Mexican sunflowers. Next on the plan: prepping the gardens and planting the cold stuff–carrots, parsnips, beets, peas, mustard greens, parsley, potatoes. Then starting the warm stuff. I’ve promised Chloë a corn field, because of a Dora the Explorer episode involving one that she loves. I ‘m hoping a few rows with a path through it will suffice, because I don’t have the room for a full one. Maybe we’ll try a corn maze (for the first time) this year. I have yet to draw up the year’s garden plan. I also have yet to get materials for a pea trellis, but I’m hoping to get both done this weekend. Then, if the weather cooperates, I can have things in the ground next week.